You are cordially invited by the Catholic Bishop’s Committee for Interfaith Relations to an evening with Melbourne-based Rabbi Fred Morgan celebrating 50 years since the Catholic Church’s Nostra Aetate statement, the Declaration on the Relation of the Church to Non-Christian Religions. You can download a flyer for the event. We Eastern Orthodox Christians believe Abraham has a special place in our religions, and even the letters of his name has special significance. The name of Abraam consist of 4 letters which was before called Abram, the the Lord said you will be called from now ever Abraham not Abram, adding the letter H in his name. So In our believe that each letter in Abraham name means something: A means Aba (Father), B means Bra (Son), R means Rookha D’qoothsha (Holy Spirit), and M means Malkootha (kingdom). When Abraham believed in God, and intended to sacrifice his son Isaac according to the order of God, the Lord added H in his name and that mean Haimanotha (faith) because, it is said in our Old Testament: Abraham believed in the Lord and was counted to him by the Lord righteousness (Genesis 15:6), so the Lord added H. in his name and that means that Abraham can not enter the Kingdom if he doesn’t believe in the Lord. 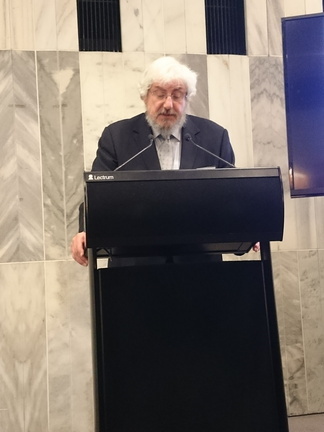 At the re-launch of the Abrahamic Council, Paul Morris, Professor of Religious Studies at Victoria University, gave the following talk. Tēnā koutou, tēnā koutou, tēnā tatou katoa; Shalom Aleychem; As salamu alykum; a peaceful good evening to you all. It is an honour and a privilege to be here this evening of Tuesday 14th day of April in the year 2015; or the 25th day of the month of Nissan in the year 5775; or 25th day of Jumada al Thani in the year 1436 (and, of course, 14 o Paenga Whawha i te tau 2015 te ra). We all, both share a contemporary reality – Aotearoa New Zealand with its Christian heritage although increasing secular culture – and simultaneously also inhabit distinctive and different religious universes with different histories and points of departure and arrival. We are here to re-launch the Wellington Council of Christians and Jews (CCJ) as the Wellington Abrahamic Council of Jews, Christians and Muslims. This is a timely development as Muslims have been welcome at meetings of the Wellington CCJ since 2007. In 1995 the International Council of Christians and Jews (ICCJ) established its “Abrahamic Forum”, a trilateral Jewish-Christian-Muslim committee, to reflect the growing importance of Islam in Europe and the US, the essential and urgent need for dialogue, tolerance and respect, and to work at the overcoming of growing fears and prejudices. Since 2010 the ICCJ has formally expanded the Christian Jewish dialogue to a Christian Muslim Jewish trialogue. My report entitled in English, “Trying Trialogues”, failed to maintain its pun when translated into German, Turkish, Hebrew or Arabic! The Council of Christians and Jews (CCJ), was founded in 1942 by Chief Rabbi Hertz and Archbishop Temple during the Nazi persecution of European Jewry. The CCJ was the product of a profound crisis. Seeing Cardinal Dew in the audience here tonight, it is interesting to note that the Catholics pulled out in 1954 on a theological issue returning only after the Vatican II Council. Christian Jewish dialogue started haltingly and defensively with participants finding it difficult to frankly address the history and legacy of Christian anti-semitism and anti-Judaism, and the recent horrors. Issues of openness, proselytization, prejudice, textual interpretation, and kashrut have kept life tense ever since. Years of effort, startling bravery, honesty and regular personal contact have led in 38 countries around the world, including New Zealand, to groups of people, Christians and Jews, now generationally, who have come to know each other and each other’s families. They have learned to trust one another and have come to understand each other’s religious lives, values and concerns. The last sixty years have shown that it is possible, if never easy, to further the project of overcoming the past and to learn to live reasonably peacefully together. It is important to record that this has been an ongoing struggle and at times these relationships have been fragile, and have sometimes broken down, but the groups have survived, grown stronger, and continue in their efforts to make the world a safer, and I would say, holier place. The realities of migration and post 9/11 geopolitics demand that we too acknowledge that we – Jews, Christians and Muslims – face a crisis. A crisis of anti-Islam and anti-Muslim sentiment, a resurgence of anti-semitism, and an upsurge of religious violence, and that it’s time for us to be courageous and honest with each other and try together to make the world a better place. But is the invention of this new notion “Abrahamic religions” anything more than a perfectly legitimate idea, that of, the inclusion of Muslims into the mainstream Judeo-Christian fold in Europe and America? I’ll return to this question in a moment below. I want to spend my remaining allotted time looking at the notion of the “Abrahamic” academically and to make a point that I hope is helpful. “Abrahamic religions” is a very recent coinage and has been utilized most widely since 2001. Peter Berger suggests that it dates from its inception as a response to 9/11. Whether this is actually the case or not it is clear that since then it has been widely in use in the academy and beyond. It has been valorized and challenged, debated and discussed. In fact, Abrahamic religions has become a new academic area as reflected in the new MA degree at the University of London offered by Heythrop College; a new Oxford Studies in the Abrahamic Religions series by Oxford University Press, kicking off with The Oxford Handbook of the Abrahamic Religions (edited by Adam Silverstein and Guy G. Stroumsa). There is also the Oxford Professorship in the Study of Abrahamic Religions, until recently held by Guy Stroumsa (2009-2013). It is the subject of scores of academic articles and a number of scholarly monographs. While some work is critical and cautious what is developing is a wholly new understanding of the intertwined histories of Judaism, Christianity and Islam (to put them in academic chronological order). This promising new history offers a range of insights that might inform our thinking today in Wellington and beyond. In his inaugural lecture, (“From Abraham’s Religion to the Abrahamic Religions,” in Historia Religionum 3 (2011), 11-22*) Professor Stroumsa begins with the very different Jewish, Christian and Muslim traditions of Abraham. He cites Eusebius of Caesarea who begins his Ecclesiastical History by reporting that Christ’s religion was discovered by Abraham and those “lovers of God that followed him”. He goes on to say that while Jews claims to be these very followers they are not, the new church is! He further traces these interpretive traditions in the literature of the rabbis and the Church Fathers. A particularly interesting reference is to Sozomen, a theologian from Gaza around 400, who describes the now lost annual festival of Abraham at Mamre, which attracted not only Christians who came to acknowledge the spiritual father of their faith; Jews to remember their “patriarch”; and, pagans because angels had appeared there! We, Jews, Christians and Muslims, have all fought to claim Abraham Avinu, Our father Abe, to be our exclusive progenitor but he belongs to all three traditions and seemingly to others too from the region. Stroumsa explores “Abraham’s religion” (Millatu Ibrāhīm [Millat e Ibrāhīm] from the Qu’ran (Sura al-Baqarah : 130) and traces Jewish and Christian responses to it and notes that these traditions differ markedly from most post-9/11 usages of the term “Abrahamic religions”. What is the study of the Abrahamic Religions? Put simply it is the three religious traditions studied together not in isolation from each other. And comparatively, that is, not in terms of which is better or worse but exploring the many similarities and equally the significant differences. The study of Christianity, Islam and Judaism (the put them in order of population) in this way reveals constantly overlapping histories often missed when limiting research to a single tradition, or even to two of them. Scholarly informed research on the three traditions is as yet thin on the ground and in many cases has been avoided by religious scholars on theological grounds. Besides some comparative philosophical work on the Muslim, Jewish and Christian re-workings of Greek philosophy and a number of local studies there is a dearth of comparative research on the three religions. Once we free ourselves, however, of the idea that each tradition is somehow a completely separate monolithic entity travelling solo through human history and begin to explore the three great Mediterranean religions on the same page, we discovers that these three traditions have an unbroken record of the creative exchange of ideas, rituals, practices, institutions, myths, ethical insights, philosophical doctrines, and of course, goods and services. That is, looking at Islam, Christianity and Judaism together, anchored in specific local historical and cultural contexts. When we examine the Abrahamic religions historically, structurally and phenomenologically we learn that all three traditions have radically developed, critically adapted, and dynamically changed, together. The truth is that there is no history of Judaism without sustained reference to Islam and Christianity; just as there is no story of Christianity without extensive consideration of Judaism and Islam; or, that that there is a history of Islam that does not require the study if its continual engagements with Christianity and Judaism. This is an academic viewpoint but one that I consider to be entirely consistent to the theologies of the Abrahamic religions. To sum up: Islam, Judaism and Christianity developed in interaction with one another. One recent example of this new approach is David Nirenberg’s new book, Neighboring Faiths: Christianity, Islam, and Judaism in the Middle Ages and Today (Chicago University Press, 2104). He emphasises their “overlapping geographics”, and writes: “Islam, Christianity, and Judaism have never been independent of each other: that is as neighbors, in close relation to one another, that they have constantly transformed themselves, reinterpreting both their scriptures and their histories. Their pasts are not discrete, independent, or stable”, and the most important consequence of this for him, is that, “neither are their presents or their futures”. (12). He calls this interdependence, “coproduction,” that is, the religions coproduce each other in a dense network of identification and dis-identification. His notion of “ambivalent neighborliness” is intended to capture something of the array of responses to the neighbour “ranging from love and toleration to total extermination” (2). Back to Abraham: Jews, Muslims and Christians have overlapping but very different traditions concerning Abraham – a topic for another lecture (see, Carol Bakhos, The Family of Abraham (Harvard University Press, 2104)) and like all our traditions each of us implicitly and at times explicitly, debates or challenges the teachings of the other two faiths. We should not fear this. We should not fear that not everything is similar and that they are real differences and acknowledge that these differences, in part, allow us to understand ourselves and each other. Abrahamic religions allow us to recognise both our distinctiveness and differences and the realities of our historical interactions and their profound impact on our histories. We cannot return to the past – and anyway it was very different from what we image it to be – but we can create the future together. Tonight is an opportunity to more beyond our separate histories to create a living reality in which we – Jews, Christians and Muslims – acknowledge our special relationships, something that is not an alternative to broader interfaith relationships but the recognition that our sacred theological histories, so often seen as parallel lines are in fact intertwined and actually intersect in the figure of Abraham/Avraham/Ibrahim and again and again thereafter through time, calling us to understand ourselves and each other as Children of Abraham; Benai Avraham; Banu Ibrahim. * See also his, “Athens, Jerusalem and Mecca: the Patristic Crucible of the Abrahamic Religions,” Studia Patristica 62/10 (2013), 153-168; and his monograph, The End of Sacrifice: Religious Transformations of Late Antiquity (Chicago University Press, 2009).